Pro Libertate: "Nothing's Either Good or Bad...." (pt.II): Some of the Missing "Family Jewels"
"Nothing's Either Good or Bad...." (pt.II): Some of the Missing "Family Jewels"
Federal counter-narcotics agent George White (left, center), who conducted involuntary drug tests on unwitting subjects as part of the CIA's MKULTRA program. As an agent of the federal Bureau of Narcotics and Dangerous Drugs (BNDD), the forerunner to the Drug Enforcement Administration, George White “knew how to milk a drug bust for all it was worth – a skill that grew out of early years spent as a newspaper reporter in San Francisco and Los Angeles,” notes John Marks in his perversely fascinating study The Search for the Manchurian Candidate: The CIA and Mind Control. White migrated from journalism to law enforcement in 1934. Although he was too late to find employment enforcing alcohol prohibition, he was just in time to make a handsome living in the emerging field of narcotics enforcement, which began in earnest in 1937. 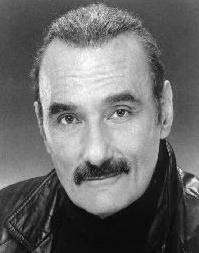 Decades later, before dying of the liver disease brought about by his insatiable appetite for liquor (he reportedly could consume a bottle of gin in a single sitting), Marks would serve as a consultant for TV detective dramas, helping to create the now-customary image of police as intrepid, largely incorruptible paladins of public order. Many police have earnestly tried to live up to that image. Marks – a short, stocky man with a tonsured head – had little use for such pretense. As a missionary in the service of the Almighty State, Marks indulged every familiar whim, as well as some that would never occur to most people. For example: I doubt that most people would be party to an experiment in which an aerosol dispenser would be used to subject unwitting guest to a potent dose of LSD. That particular experiment went awry because of unfavorable weather, but White and others involved in the CIA's MKULTRA program were successful in testing the drug on many unsuspecting people. It's likely that we'll never know how many. White was eager to join the CIA after WWII, but somehow this was prevented by J. Edgar Hoover. He also sought appointment as head of New York City's narcotics bureau, only to have his candidacy blocked by Governor Thomas Dewey. 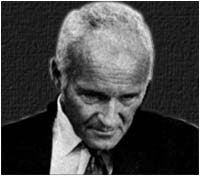 But his talents – such as they were – and, more importantly, his connections made White irresistible to Richard Helms, Sid Gottlieb, and the others involved in MKULTRA, who were eager to learn of LSD's utility as a truth serum, mind control drug, and general-purpose chemical weapon. In May 1953, White and Sid Gottlieb set up a “safehouse” in Greenwich Village that was used to lure guinea pigs for drug experiments of various kinds (particularly LSD and concentrated marijuana), as well as tests involving knock-out drops and various kinds of surveillance equipment. The CIA paid all the bills, including the exorbitant expenses involved in keeping White's liquor cabinet full. As the CIA examined the possible field use of LSD against hostile foreign leaders – such as Fidel Castro – it was necessary to test it on as many unsuspecting targets as possible. To facilitate such “dry runs,” White expanded his little federally sponsored criminal syndicate by setting himself up as a full-service vice lord – both drug pusher and pimp. By the time White's grimy business was shut down in 1963, the harvest had begun to come in from Sid Gottlieb's efforts – which had begun ten years earlier – to cultivate the drug culture in academia. Using tax-exempt foundations as cut-outs – particularly the Josiah Macy, Jr. Foundation and the Geschickter Fund for Medical Research – Gottlieb funded “LSD pathfinders” in such institutions as Columbia University, the University of Rochester, the University of Oklahoma, the University of Illinois Medical School, Mt. Sinai Hospital, Boston Psychopathic,and the Addiction Research Center in Lexington, Kentucky (which was also funded by the National Institutes of Mental Health). These CIA-sponsored researchers have been described as the “Johnny Appleseeds of LSD”; nearly all of them tried the drug themselves before experimenting with it on others. Prison inmates were offered various inducements – including other hard narcotics – to serve as test subjects. Among those recruited into this program was a small-time thug named James Bulger, who would go on to become the FBI-protected head of Boston's Irish Mob. “Sharing the drug with the Army here, setting up research programs there, keeping track of it everywhere, the CIA generally presided over the LSD scene during the 1950s,” writes Marks. It is no small matter that there were, at that time, two companies producing LSD – Eli Lilly and the Swiss firm Sandoz; Lilly turned over its entire supply to the Agency, and Sandoz kept it apprised of every shipment it made anywhere in the world. By the mid-1960s, the trade in narcotics – including LSD – had become more diversified, thanks in no small part to the academic “Johnny Appleseeds” who had worked with MKULTRA. There's more than simple nastiness involved in the CIA's creation of the modern narcotics industry. About a decade ago, former DEA undercover agent Mike Levine -- one of the bravest and most self-effacing men I've been honored and blessed to meet -- described a 1979 conversation with a CIA officer in Argentina. "There was a small group of us gathered for a drinking party at the CIA guy's apartment," Levine recounted to me. "There were several Argentine police officers there as well; at the time, Argentina was a police state in which people could be taken into custody without warning, tortured, and then `disappeared.'" "At one point my associate in the CIA said that he preferred Argentina's approach to social order, and that America should be more like that country." "Somebody asked, `Well, how does a change of that sort happen?' The spook replied that it was necessary to create a situation of public fear -- a sense of impending anarchy and social upheaval in which the people will literally plead with Congress, `Take whatever rights you need, but save us...."
That is, "save us" from the scourge of drugs, or terrorism, or violent crime, or whatever social plague leaves the public usefully terrified. Levine, who spent decades in "deep cover" operations for the DEA, candidly admits that the "war on drugs" turned the federal government into "essentially a criminal enterprise." He also acknowledges that "the CIA has long been a major supporter of the people and organizations responsible for supplying drugs to this country"; this includes various factions of the Afghan Mujahadin and the Nicaraguan Contras, Khun Sa's Shan United Army in Burma's Golden Triangle, small-caliber despots like Manuel Noriega (anybody remember him? ), the Kosovo Liberation Army, and others of that ilk. 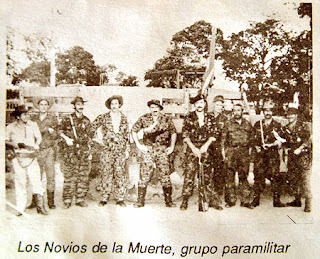 "Los Novios de La Muerte," the paramilitary group that -- with the CIA's help -- turned Bolivia into (Klaus) Barbie's Playhouse. The CIA, according to Levine, has also staged coups in order to install narco-regimes, as it did in Boliva in 1980, working in concert with Los Novios de la Muerte ("The Fiancees of Death"), a paramilitary force recruited by Nazi fugitive Klaus Barbie. The "war on drugs," as I've pointed out elsewhere, is a narcotics price support program, in addition to being a form of employment insurance for various three-letter agencies and militarized police units across the country. I'm convinced that one reason so much effort is invested in drug "interdiction" campaigns -- which is a bit like taking a sponge mop to the Atlantic Ocean -- is that this inflates the amount of off-the-books funding available to the CIA and its satellite organizations. And as Levine points out, it's not true that the War on Drugs is a losing proposition: "The fundamental problem with the so-called war on drugs is that both sides are winning -- the drug lords and the `suits' -- because they both are making a killing." My friends, please pray for my dear wife Korrin. Her health has taken a severe turn for the worse, and I'm at the end of both my wits and resources in trying to help her. Please be sure to visit the Liberty Minute archive, and The Right Source. Korrin is in our prayers. Hang in there, brother. May Heavenly Father bless Korrin. We also ask that God bless you and your children through these times. We are sorry for all you have had to deal with. Korrin will be mentioned in our family prayers. Always an invitation to renew an old friendship and meet new friends if your family is in the Top of Utah. I'm very sad to read that your wife is in such dire health, Will. You've mentioned it in the past, but I just didn't take it to be as critically serious as it apparently must be. I will earnestly pray for your wife's recovery and to grant you the divine strength required to carry on faithfully in the midst of such an extreme trial, for your children's sake especially. Also, try to keep Romans 8:28 in mind throughout, brother Will. May God Bless You and Yours. Will, if its at all possible, it would help to know what we are praying for. I prefer to pray for specifics, though generally doesn't hurt. On the points you made in regards to the drug "price support system" I have to agree. It suddenly hit me, while looking at all the multi-story buildings being demolished downtown, that my city government (at tax payer expense - of course) was tearing down these structures in order to raise the rental rates for the remaining buildings. Now, I thought, who would benefit from that? Clearly, if one were to follow the money, there could be a connection. Call me cynical but human nature hasn't failed to disappoint. Re: Korrin -- I sincerely pray you discern what God is up to, and have the faith to embrace it. Also good luck to your wife, and to you too!